The Sturgeon Bay Ship Canal Light and Sturgeon Bay Ship Canal North Pierhead Light are located on an active Coast Guard station. To reach the lights, visitors must park in the lot just outside the station’s gate and follow the driveway that leads from the front gate to the seawall. The Ship Canal Light is the large white tower on the station grounds and the North Pierhead Light is the impressive red structure straight ahead at the end of the seawall. It’s important to remember that visitors aren’t allowed to roam the Coast Guard station grounds. Throughout the summer and winter, Coast Guard personnel are busy handling water and ice rescues and other incidents. In 1873, when construction began on the Sturgeon Bay Ship Canal, the Lighthouse Board recommended that a light and fog signal be built on the breakwater that was being constructed at the Lake Michigan end of the canal. Congress finally appropriated money for this light in 1881. Work began late that summer with a construction crew erecting a white, open framed tower on the outer end of the north entrance pier. The focal plane of the 6th order Fresnel lens in the lantern on the tower was 29′ above the pier and 35′ above the water. On May 15, 1882, Rufus M. Wright, keeper, displayed the fixed red light for the first time. The crew also built an elevated walkway on the pier from the shore. There was not enough money for a keeper’s dwelling, so Wright lived on a dredge working on the canal. Two years later, a crew built two steam fogsignals, each in a separate building, toward shore from the light on the north pier. The first fog signal, a ten inch steam whistle, was put into operation in August 1884. Due to the increased workload, an assistant keeper was also appointed in 1884. Residents eight to twelve miles away now were well aware when fog appeared at the station. The second fog signal was completed in 1886, as was a dwelling for the keeper. In 1886, the same year the second fog signal was completed, the Lighthouse Board gave the Life Saving Service a parcel of land next to the canal for a life saving station. This station went into operation shortly after. The Federal Government purchased the ship canal in 1893 and placed it under the authority of the U.S. Corps of Engineers. 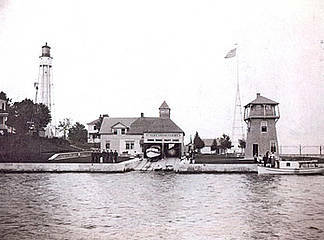 The Engineers transferred responsibility for the operation of the three navigational lights along the canal to the Lighthouse Board in 1896, and a second assistant keeper was added to the station’s crew. Even before the purchase, maritime interests began calling for the building of a more powerful coast light at the entrance of the canal. In 1890, the Lighthouse Board recommended building such a light on shore near the keeper’s dwelling. In 1893, Congress authorized the light, but did not appropriate the $20,000 needed to build it for another two years. It wasn’t until May 1898 that construction on the site actually begin. The design of the light was new and unique. Rather than a masonry or steel tower like the Cana Island Light,the Sturgeon Bay Light was double walled steel cylinder 8′ in diameter and rising almost without bracing to a height of 78′. On top of the tower sat a watch room, 12′ in diameter and 7′ high, and above it was a cast iron lantern approximately 18′ high and 8′ wide. A spiral staircase filled the inner shell of the tower and gave access to the lantern. Eight buttresses, 16′ high, provided the tower’s only bracing. In November 1898 when the light was exhibited unofficially for the first time, it was immediately apparent that there was a serious problem. The new tower vibrated so badly in the wind that it affected the operation of the light. Four wire guy lines were attached to the tower in an effort to stiffen it, but the tower still swayed. On March 17, 1899, with the vibration problem still unsolved, the light officially began operating. The third order Fresnel lens alternated red and white flashes. The focal plane of the light was 107′ above lake level. The lantern was painted black but the tower was reddish brown until it was changed to white in 1900. Finally in 1903, the Lighthouse Board decided to make major changes at the station. The present skeletal steel framework was erected to support the watch room and lantern leaving the original steel tower to support only the spiral staircase inside it. This solved the vibration problem. The Board also decided to replace the fog signal buildings and pier head light tower with the present combined steel fog signal and light tower. Originally painted white, the structure was later painted red. The keeper’s dwelling was expanded and remodeled to accommodate three keepers. In a 1915 governmental reorganization, the Coast Guard absorbed the Life Saving Services and began manning the life saving station at the canal. On July 7, 1939, the Lighthouse Service was transferred to the Coast Guard. 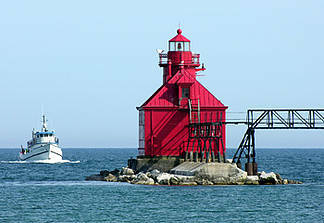 The Sturgeon Bay Canal Station Light is now manned by Coast Guard personnel.